This web site is an ongoing experiment in historical narration and historiography, with intended implications for historical pedagogy. The Welcome page contains brief examples of how I am structuring daily Narratives and parallel Historiographical Unpacking chapters, as well as introducing additional features of the site. Getting Started contains pedagogical material, including lessons plans, documents, and schemas used in teaching students how to prepare historical essays and research, with links to the Bibliography, and from there to the John Snow Archive & Research Companion and other free online resources. Detail from GBoH Frontage Plan (July 1855); cholera deaths erased. Early afternoon, 2 September 1854. Back parlor, ground floor, 40 Broad Street. Wiliam Rogers quickly flipped the pages of his case notebook backwards until he reached mid-June, then slowly read forward until he found the desired entries. Frances Lewis’ first serious attack of diarrhea had occurred when she was in her third month of life; she responded pretty well after four days of treatment. She relapsed in mid-August, yet the diarrhea gave way to treatment after a few days, only to return the morning of 28 August, this time accompanied by vomiting whenever Mrs. Lewis attempted to feed her boiled ground rice and milk–her usual fare since shortly after birth since Mrs. Lewis was unable to suckle her. Purging and vomiting had ceased on the 30th, the last time he saw her, but her appetite never returned and she was dead when he arrived today. Police Constable Lewis was on duty; Sarah Lewis was alone with their dead daughter. Historiographical unpacking (HU): I wrote this narrative as a mixture of indirect and free indirect speech, adapting for historical narration two styles commonly employed in modern fiction (Wood 2008, 8-9); see Appendix D and discussion of narrative form in Prologue (HU). As a style, indirect speech is quite conventional in history–historians narrate what they believed happened, based on their interpretation of documents and other sources. Free indirect speech is frequently used in modern fiction to express a character’s internal thought. I employed it, for example, in the paragraphs where Rogers examines the back yard and kitchen, which are based on conditions reported later in the month by a health inspector (UK. GBoH. 1855, 345). In addition, I have extended the reach of free indirect speech to include conversations, which are not set in quotations (direct speech) unless they were recorded as such. The narrative is imagined, but it isn’t fictional. The conversation between Sarah Lewis and Dr. Rogers, as well as Rogers’ thoughts and movements, are based on an exacting transformation of documentary evidence. Eight months after the death of Frances Lewis, Henry Whitehead (1855) happened upon the following entry Weekly Return for 9 September 1854.: Whitehead, a member of the parish committee inquiring into the causes of a horrific cholera outbreak in St. James, Westminster, had been tasked with investigating all attacks in Broad Street, where stood a local pump that some committee members considered a prime suspect. The timing and duration of the infant’s death (unnamed in the entry), as well as the proximity of the house to the pump, struck Whitehead as worthy of a follow-up, even though cholera was not listed as cause of death. He visited Sarah Lewis, from whom he probably learned that Rogers was the attending physician during her daughter’s illness. Whitehead then called on Rogers, who agreed to compose a letter for inclusion in Whitehead’s report to the parish committee (160-67; Rogers’ letter, 163-65). All sources and how I used them are explained in chapters unpacking the Prologue and the daily narratives. Sometimes I include a section on additional documentation. I would, for example, extend credit to Dave Boylan (2009) for genealogical sleuthing that eventuated in identifying the infant girl who died at 40 Broad Street on 2 September 1854. I verified Rogers’ surgery address and credentials in Watkins (1852, 613), Kelly & Co. (1856, 159), and the British Medical Directory (1853, 426); the Grapes public house in Watkins (1852, 891); and the location of William Barney Parkes’ sub-district registry office in Kelly & Co. (59). 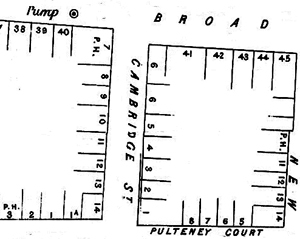 The narrative contains two images: an inset showing the pump and sewer grate from the map in Cooper (1854); and another altered detail from the GBoH frontage plan (UK. GBoH. Medical Council 1855). (CIC 1855, after 170); adapted by Mike Rip for CCSoA, 307). Now for the dramatic irony associated with the death of Frances Lewis. 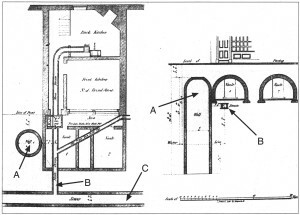 Despite Dr. Rogers’ insistence that the infant had not died of cholera, Jehoshophat York, parish surveyor and secretary of the parish inquiry committee, shared Whitehead’s suspicions and ordered an examination of the house drainage in relation to the well (A in the illustration) underneath the popular pump situated just outside 40 Broad Street. 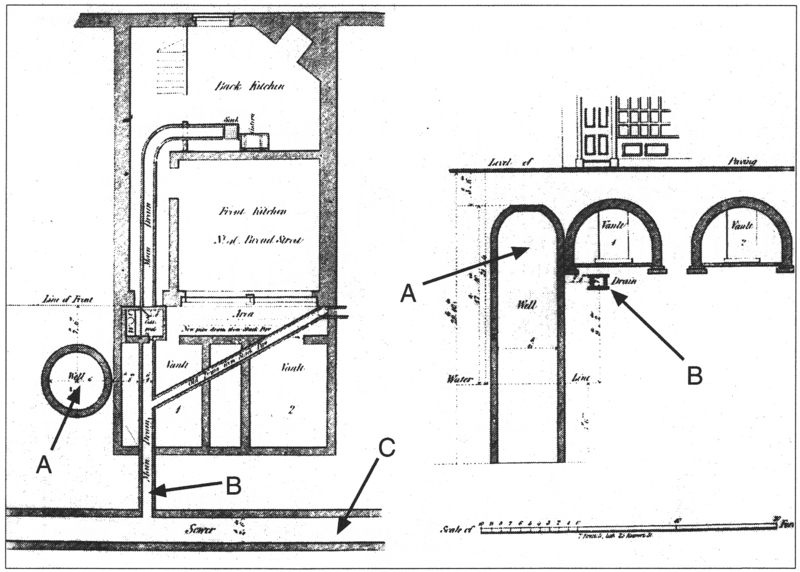 Mr. York and his team discovered extensive leaking in brickwork of the cesspool under the house privy and the main drain (B) to the sewer line (C) in the street. Consequently, the soil next to the well was heavily saturated with excremental waste. York also discovered gaps in the stone work lining the well near the main drain from the house. This happened on the 1st of May, 1855. No one during the 1854 epidemic thought anything was unusually amiss with the drainage at 40 Broad Street or its impact on water quality from the pump just outside the front door. Whitehead hypothesized that Frances Lewis’ diarrhea was actually due to a cholera infection, and dejections from her soiled diapers had seeped into the Broad Street pump, some of which would have been ingested by users for several days, resulting in the horrific 1854 outbreak in parts of St. James, Westminster. But given the state of scientific knowledge and technology in England at the time, it seemed just as likely that fetid soil outside 40 Broad Street had harbored the infectious agent of cholera, from which it spread outward in a stinking, atmospheric cloud. We, however, know what Whitehead and his contemporaries did not, and could not, know about Vibrio cholerae bacteria and the vehicles that disperse it. Please replace such modern knowledge with empathy as you read the narratives in which I attempt to convey very different worldviews from ours. The Prologue and Introduction establish the historical problem and justification for why I believe this story merits a retelling. So far, I’ve posted the 31 August 1854 narrative and unpacking chapter, as well as a preview of what will be in the 1 September narrative.